Builders commonly use concrete for sidewalks or walkways in residential and commercial applications. Concrete is readily available in most areas and requires less specialized equipment than asphalt and less labor than brick pavers. The strength and durability of the concrete walkway is impacted by the thickness of the slab. 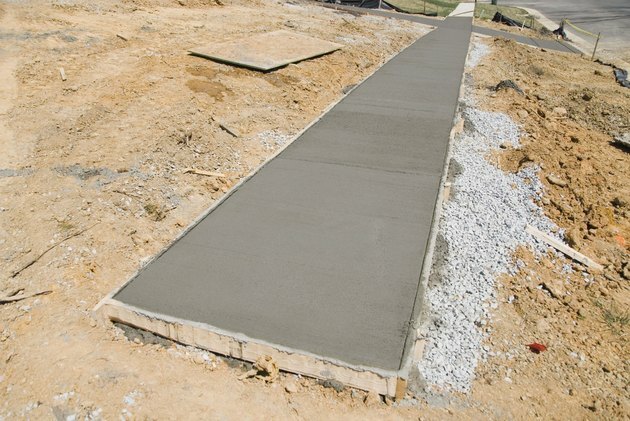 Most builders pour concrete walkways about 4 inches thick. Most builders pour a 4-inch thick slab for a sidewalk or walkway, which provides a solid surface to support foot traffic and light-wheeled vehicles such as bicycles or hand carts. Properly cured concrete is hard, durable and water resistant. Using 2-by-4-inch boards as forms and leaving a 1/2-inch clearance under the boards produces a 4-inch thick walkway slab. At this thickness, 1 cubic yard of concrete covers about 80 square feet of walkway. A base or bed of gravel between 4 and 8 inches thick supports the concrete walkway. Pack the gravel using a vibrating plate tamper to produce a firm bed for the concrete. Never pour sidewalks or walkways over grass or sod. The organic plant material decays and causes the base to settle, which can lead to cracks in the sidewalk. Steel reinforcing rods or fiberglass fibers add strength to the concrete walkway. The reinforcing material prevents the shifting of the walkway if cracks develop and helps keep the walkway from developing differences in height that could cause people to trip or fall. Walkways that cross driveways should be thicker to support the weight of vehicles. Thicknesses of about 7 1/2 to 8 inches are suggested, which provides added strength to the areas where necessary to carry the additional load. The walkway only needs to be thicker in the area of the driveway. For example, pour a 4-inch thick walkway along the street using 2-by-4-inch boards for forms, and use 2-by-8-inch boards for forms where the walkway crosses the driveway.